Karatal is a hand percussion instrument from India. This karatal pair is another form of manjira or hand cymbal. 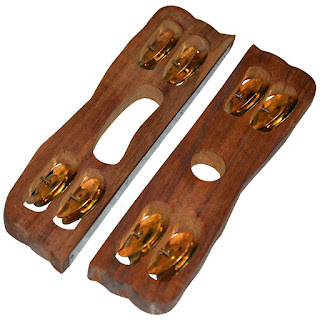 This kartal pair is consist of a wooden frame with two long, straight handles that connect to each other with two short wooden handles; the open space between the long handles has a wooden separator that separates two rows of three brass cymbal. There are also small cymbals fixed into wood blocks forming another type of instrument.